Become a knowledgeable Four Kinds consumer! Many purchase their “lulav sets” from their rabbis, in which case the rabbi ensures that they receive a ready-to-go, quality, kosher set. For the adventuresome folks, however, who wish to venture into the uncharted waters of the Four Kinds market, here are some basic guidelines and tips that, when followed, will allow you to be a relatively knowledgeable consumer. In addition, the information below is valuable regardless where you purchase your Four Kinds—for certain common defects can invalidate an originally kosher set. The Torah (Leviticus 23:40) commands us to take a “beautiful” fruit. Since “beauty is in the eye of the beholder,” no two people share the exact same taste when choosing their setsThe Torah is referring to the etrog; but the sages, employing Talmudic methodology, deduced that the requirement of obtaining a beautiful product applies to the other three species as well. Therefore, while we will discuss various concerns that can possibly invalidate any of the Four Kinds, it is also important to choose specimens that are fresh and aesthetically pleasing. And since “beauty is in the eye of the beholder,” no two people share the exact same taste when choosing their sets. This is one of the reasons why many prefer to use an etrog that comes from the Italian province of Calabria, also known as a “Yanover” etrog. The etrog orchards in this region have been providing etrogim for centuries, and are known to be of untainted pedigree. All the leaves on a lulav are naturally doubled, with the two halves of each leaf folded over and tightly connected to each other. The middle leaf on the very top of the lulav, called the t’yomet—i.e., the leaf extending from the top of the lulav’s spine, as opposed to the leaves that branch off from its two sides—is quite crucial, for if it is significantly divided, then the entire lulav is invalid.1 If, however, it is only slightly divided, the lulav is still kosher—but ideally you should try to purchase a lulav whose t’yomet is complete. The t’yomet is very delicate, and is very easily split. For this reason, the lulav should always be handled carefully; one should never allow its point to bang against anything. Aside for the t’yomet, when choosing a lulav, one should try to find one that is straight and fresh (more green, less yellow). The beauty of an etrog is determined by its cleanliness—i.e., its lack of any defects or discolorations—and its shape. The ideal etrog is somewhat oblong, not round like a ball; bumpy, not smooth; and its stem should protrude from a depression at its bottom. An etrog that is missing even an iota of its rind is invalid2 (unless it was pierced while it was still on the tree, and a new layer of skin grew to cover the cavity). Be careful with your fingernails when handling the etrog . . . If the etrog has bubbles projecting from its exterior in more than two places, it is invalid. Similarly, it is invalid if it is discolored in more than one area. Discoloration invalidates an etrog only if it is noticeable when taking a cursory glance at the fruit; there is no need to closely examine it for this purpose. Oftentimes, an etrog has light brown spots on its skin—similar to a scab—resulting from a leaf lying on that area while it was growing. These spots do not invalidate an etrog. 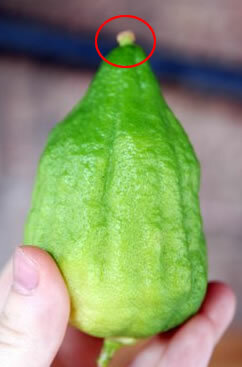 Black spots on the etrog, however, do pose a problem if they are easily noticeable and appear in more than one area. Many—but not all—etrogim grow with a pitam, a stem-like piece of wood that protrudes from its top. If the pitam completely falls off or is entirely removed, leaving the fruit bare, the etrog is invalid. An etrog that grew without a pitam is one hundred percent kosher. Likewise, the etrog is invalid if its stem, on its bottom, is completely removed. The main beauty of an etrog is in its top third, the part that slopes outwards. In this area, even one bubble or area of discoloration invalidates it. 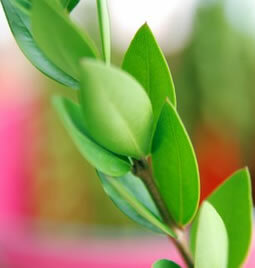 In order for a hadas to be kosher, its leaves must protrude from the stem in sets of three (or more). This pattern is known as being meshulash, “tripled.” If the leaves grow in sets of two, with the third leaf higher or lower than the other two, the hadas is invalid. However, it is kosher as long as the top 4¼ inches of the hadas is meshulash. Today, most hadassim come prepackaged and certified kosher. Note: If the majority of the “sets of three leaves” have lost more than one leaf, the hadas may not be used. There are no real requirements for the aravah, other than that it be from the correct species, the “river willow.” (One thing to be wary of: aravot are often quite long, and are trimmed in order to fit the lulav. Care must be taken that they are trimmed from their bottoms, not their tops.) Note: In order for the aravah to be okay for use, most of the leaves need to be fresh and intact. If most of the leaves of the aravah fall off or dry up, the branch may not be used. Now that you have your kosher set of the Four Kinds, they need to be bound together. See Binding the Four Kinds on how to do this. See The Four Kinds: The the Lulav and Etrog for the blessings and Waving the Four Kinds—A Pictorial Guide on how to shake the lulav and etrog. 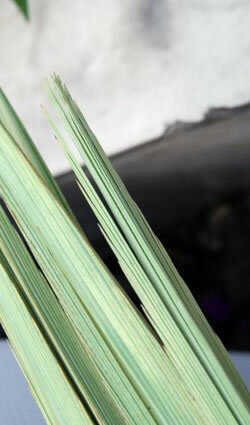 The splitting of the middle leaf invalidates the lulav for use only for the first two days of the holiday (the first day, in Israel). This, too, applies only to the first two days of the holiday (or the first day only, in Israel). 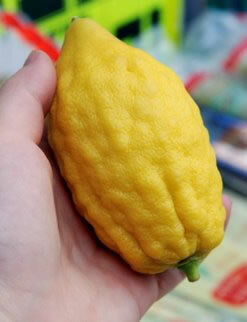 Why an Etrog and Not a Lemon? If the infestation causes the Etorg to dry out, be missing anything, such as a hole, split, crack, or pealing it renders it Passul. The verse is in Leviticus 23:40 chabad.org/9924 and the Talmud in Sukkah 35a discusses how we know that the verse means an Etrog. To Sarah The blessing on the Lulav and Etrog is said each day of Sukkot, except on Shabbat, during the daytime, preferably in the morning. and what is the blessing? is there another english translation??????? ?